Color(s) of the Year: 2013 | Alcher Interiors, Inc. I love it when various companies, organizations, tastemakers and color gurus introduce their respective Colors of the Year. Some years, the consensus seems to align around a single tone or shade – remember tangerine? – while other years, the palette is as diverse as a box of crayolas. Historically, it was the Pantone Color Institute that took the lead with color recommendations. This year, they choose Emerald Green as Color of 2013. But this is one of those crazy years with lots of competing ideas for best color. The world’s largest paint company has selected Indigo Night. They claim Indigo Night shows maturity and elegance. For us blue lovers, it’s a welcome return after being absent for several seasons. For those partial to green, Sherwin Williams has chosen Aloe – which to me looks like a darker spa green. It’s a very retro color, great for a relaxing sun room. (Hint: if you’ll be choosing a more ‘contrast look,’ pare it with bright corals or lilacs. 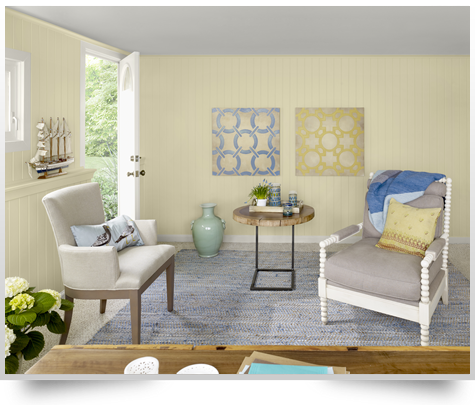 Paint company Benjamin Moore has chosen a softer color in Lemon Sorbet. They suggest to use Lemon Sorbet as a transition between mid-tones and saturated colors. They feel pastels are returning to favor. The color rule for 2013? Have fun – on walls, chairs, floors and more. Whatever you choose, Alcher Interiors has the fabric, tile, rugs & carpet, paint colors and products to help you assemble your new look for 2013.